If you thought the HKS GT570 was a bit underpowered, this Amuse-tuned Nissan GT-R should satisfy. It's cranking out 602 HP at 6500 RPM and 571 lb-ft of torque at 5300 RPM. That's enough grunt to warrant the addition of boy-racer bits like a huge rear wing, fat lip spoiler, stiffer height-adjustable springs and carbon-kevlar Recaro seats. 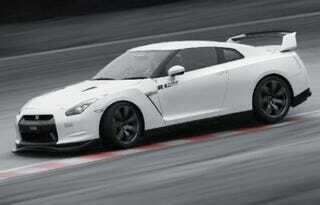 But, despite the extra flair, the Amuse GT-R weighs in at 100lbs less than the standard car. Parts should be officially arriving in the US early next year, but for now you can check out a clip of the Amuse GT-R ripping up Tsukuba (back when the car was only making 582 HP) from Best Motoring after the jump.